↑ "Resolution". Federal Council Bulletin (Religious Publicity Service of the Federal Council of the Churches of Christ in America). 25-27. 1942. ↑ Fifty-Eighth Annual Session (in English). Order of the Eastern Star. 1932. "Today the Christian Flag is flying over Europe, Asia and Africa, as well as America." ↑ "The Christian Flag". Bob Jones University. Archived from the original on Sep 5, 2005. Retrieved 2007-10-18. "The white on the flag represents purity and peace. The blue stands for faithfulness, truth, and sincerity. Red, of course, is the color of sacrifice, in this case calling to mind the blood shed by Christ on Calvary, represented by the cross." ↑ The American Lutheran. 22–24. American Lutheran Publicity Bureau. 1939. ↑ A Theological Miscellany. Thomas Nelson. 24 March 2005. "The flag is white (for purity and peace), with a blue field (faithfulness, truth, and sincerity) and a red cross (the sacrifice of Christ)." ↑ "The Christian Flag". Prayer Foundation. Retrieved 2007-10-18. 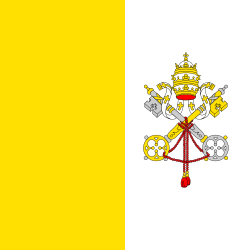 "The flag's most conspicuous symbol is the Christian cross, the most universal symbol for Christianity. The red color represents the blood of Christ and brings to mind his crucifixion. Christians believe that Jesus Christ's death and resurrection is the means God uses to save believers from their sins. The cross and blood have been used since earliest Christianity to symbolize salvation through Jesus; in the words of the Apostle Paul, "And having made peace through the blood of his cross, by him to reconcile all things unto himself;" — Colossians 1:20. The white field draws on symbolism throughout the Bible equating white clothes with purity and forgiveness. People who have been "washed white as snow" in the Bible have been cleansed from their sins (Isaiah 1:18; Psalm 51:2). In conventional vexillology (the study of flags, their history and symbolism), a white flag is linked to surrender, a reference to the Biblical description Jesus' non-violence and surrender to God's will. The symbolism behind the blue canton has been interpreted to represent Heaven, truth, or the Christian ritual of Baptism in water." ↑ "Christian Flag". The Christian Advocate (in English) (New York: T. Carlton & J. Porter) 84. 7 January 1909. "Within recent years (1897) a flag has been designed which shall stand as an emblem around which all Christian nations and various denominations may rally in allegiance and devotion. 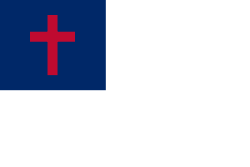 This banner is called the Christian flag. It was originated by Charles C. Overton of Brooklyn, N.Y., whose first thought of it came to him while addressing a Sunday school at a rally day service. The flag is most symbolic. The ground is white, representing peace, purity and innocence. In the upper corner is a blue square, the color of the unclouded sky, emblematic of heave, the home of the Christian; also a symbol of faith and trust. in the center of the blue is the cross, the ensign and chosen symbol of Christianity: the cross is red, typical of Christ's blood. The use of the national flag in Christian churches has become almost universal throughout the world." ↑ Coffman, Elesha. "Do you know the history of the Christian flag?". Christianity Today. Retrieved 24 April 2014. ↑ James R. Pollock, Ph.D., D.D. (23 March 1996). Congratulations to The Christian Flag, Fourth Edition (in English). ↑ Temperman, Jeroen (2010). State-Religion Relationships and Human Rights Law: Towards a Right to Religiously Neutral Governance (in English). Brill Academic. p. 88. ISBN 9789004181489. "Many predominantly Christian states show a cross, symbolising Christainity, on their national flag. Scandinavian crosses or Nordic crosses on the flags of the Nordic countries–Denmark, Finland, Iceland, Norway and Sweden–also represent Christianity." ↑ Evans, Andrew (2008). Iceland (in English). Bradt Travel Guides. p. 27. ISBN 9781841622156. "Legend states that a red cloth with the white cross simply fell from the sky in the middle of the 13th-century Battle of Valdemar, after which the Danes were victorious. As a badge of divine right, Denmark flew its cross in the other Scandinavian countries it ruled and as each nation gained independence, they incorporated the Christian symbol." ↑ Temperman, Jeroen (2010). State-Religion Relationships and Human Rights Law: Towards a Right to Religiously Neutral Governance (in English). Brill Academic Publishers. p. 88. ISBN 9789004181489. "Many predominantly Christian states show a cross, symbolising Christianity, on their national flag. The Union flag of the United Kingdom of Great Britain and Northern-Ireland makes reference to three Christian patron saints: the patron saint of England, represented by the red cross of Saint George, the patron saint of Ireland, represented by the red saltire of Saint Patrick, and the patron saint of Scotland, represented by the saltire of Saint Andrew." ↑ Foley, Carol A. (1 January 1996). The Australian Flag (in English). Federation Press. p. 10. ISBN 9781862871885. "The Christian cross, for instance, is one of the oldest and most widely used symbols in the world, and many European countries, such as the United Kingdom, Norway, Sweden, Finland, Denmark, Iceland, Greece and Switzerland, adopted and currently retain the Christian cross on their national flags." ↑ Temperman, Jeroen (2010). State-Religion Relationships and Human Rights Law: Towards a Right to Religiously Neutral Governance (in English). Brill Academic. p. 88. ISBN 9789004181489. "The cross on the flag of Dominica represents Christianity while the three colours of which the cross consists stand for the Trinity. The coat of arms depicted on the flag of Slovakia shows a double cross. The flag of the Dominican Republic represents Christianity while the three colours of which the cross consists stand for the Tinity. The coat of arms depicted on the flag of Slovakia shows a double cross. The flag of the Dominican Republic shows the words "God, Fatherland, Liberty", an opened bible and a cross (depicted in the coat of arms which is represented in the centre). The 'five-cross-flag' of George shows four small crosses and a large St. George's Cross, referring to the patron saint of Georgia (the national flag of England shows the St. George's Cross as well). The white cross on the flag of Greece symbolizes Greek Orthodoxy. The flag of Moldova shows its coat of arms in the centre: an eagle with a Christian Orthodox cross in its beak. The coat of arms of Serbia, as depicted on the national flag, also shows an Orthodox cross." ↑ McCandless, Byron; Grosvenor, Gilbert Hovey (1917). Flags of the World (in English). National Geographic Society. p. 403. "The Portugal man-of-war (1182) and merchant flags (1183 and 1184) bore the same distinguishing features— five shields with the five circles representing the five wounds of Christ, the castles surrounding the inner shields and the armillary sphere, reminiscent of that nation's maritime prowess in the sixteenth century, 200 years ago, as they do now." หน้านี้แก้ไขล่าสุดเมื่อวันที่ 4 มิถุนายน 2561 เวลา 21:11 น.